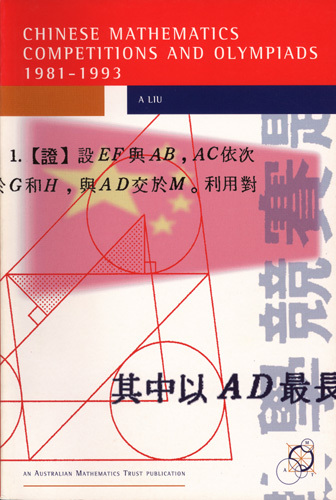 This book contains the problems and solutions of two contests: the Chinese National High School Competition from 198182 to 199293, and the Chinese Mathematical Olympiad from 198586 to 199293. China has an outstanding record in the International Mathematical Olympiad, and the book contains the problems which were used to identify the team candidates and select the Chinese teams. The problems are meticulously constructed, many with distinctive flavour. They come in all levels of difficulty, from the relatively basic to the most challenging. "This material from China, one of the consistently strong countries through its few years in the International Mathematical Olympiad, will add a richness to the English speaking literature which did not previously exist."